Go on a Puzzle Hunt! Take puzzle pieces from a classroom puzzle and hide them throughout the room. Let children find the pieces then work together to put the puzzle together. If pieces are still missing, they will have to continue to hunt for them. Put old puzzle pieces in the sensory table. Make puzzle rubbings. Place puzzle pieces under a sheet of paper. Using the side of a crayon, rub the puzzle shape. Make a puzzle piece picture frame. Put children’s pictures in their frame for a parent gift. Have children wear summer clothes. Or ask children to wear clothes inside out and backward. Eat dinner foods for breakfast. Eat breakfast foods for lunch. Play Simon Says, but have children perform opposite tasks of what is suggested (ie. Simon Says Shake your hands very fast = children shake hands very slow). Fill one bucket with warm water and one with ice water. Have your children stick one hand in each bucket and experience the difference. Sorting! Ask children to find any toy in the room. Sort the toys by large/small. Think of other categories to sort. Float and Sink. Have children find one item in the room. Conduct a float/sink experiment, by asking children to place their item in a tub of water. Sort by whether the item floats or sinks. The Early Childhood Academy is up and running! 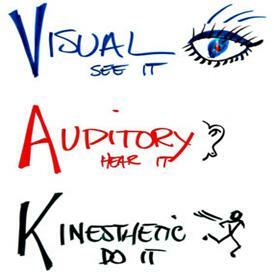 We have three 1-hour classes as part of our Learning Styles series. Each classes focuses on characteristics of each learning style, such as how they learn and the types of materials to use to aid in learning. Participants will also learn how to plan curricular activities and lessons to meet the needs of each type of learner in their early childhood program. Click link(s) below to enroll now. Start right away and print your certificate at the end of the class.